Welcome to issue 192. This month I have finally managed to read The Science of Discworld 4. It's been tough finding time to fit it in and it's a book that needs some concentration. Read my review later in this issue. This month we can mention the title of the next Discworld book that we teased about in issue 190. The next Discworld novel will be called Raising Steam. Terry announced the title to the guests of the recent Australian Discworld Convention via a Skype call. Next month's issue will be our 16th Birthday issue and I plan to have a pint or two in Wincanton at the Spring Fling at the beginning of May to celebrate. Last month we mentioned that Guards! Guards! would be on BBC Radio 4 Extra at 18:30. Unfortunately this information appears to have been incorrect and the correct time was 18:00. I apologise if you missed any episodes because of this. The Discworld Monthly facebook group continues to grow (albeit at a slower rate than last month) and now boasts over 4,700 members. Topics flow thick and fast and a real feeling of community is developing. If you want your Discworld Monthly fix between issues, make sure you visit. Terry's new Documentary Terry Pratchett: Facing Extinction will be shown on BBC2 on Wednesday 27th March at 9PM. Also on the 27th March on Radio 4 is the final part of the radio production of Eric. Sadly by the time you read this the first three episodes will no longer be on BBC iPlayer. Rhianna Pratchett was recently interviewed about reclaiming Lara Croft and having Discworld creator Terry as a dad. Rhianna has also been quoted as saying that she would be interested in another Discworld computer game in a recent interview with Digital Spy. Rhianna also talks about the future of Discworld at Digital Trends - Discworld is mentioned after talking about the Lara Croft reboot. SFX Magazine are running a poll to ask readers which sci-fi / fantasy series they should create a "Specials" magazine for. One of the options is Terry Pratchett. After a couple of months of silence a new Pratchett Podcast has been recorded. The delay was due to Pratchett Podcast creator Graeme Sheridan moving home. Issue 15 includes a review of Guards! Guards! and the usual mix of clacks, members of the Watch and news. Visit the Pratchett Podcast facebook page for information on how to subscribe to the podcast. The 11th March would have been Douglas Adams' 61st birthday. An article in the Guardian claims that Adams is still the king of comic science fiction but the writer also thinks that Terry Pratchett and Neil Gaiman are contenders for the throne. Thanks to Lady Sybil for the link. Terry's original Orangutan documentary Jungle Quest from back in 1995 is about to be released on DVD. Unfortunately the tv6 site doesn't yet mention how you can get hold of it. US residents can now purchase BackSpindle's Guards! Guards! game direct from the US saving quite a lot of money on postage. David Brashaw of BackSpindle has recently dispatched 100 copies of the 2012 edition of the game (including the updated rules) to Game Salute in the US. 8th March 2013: (FX Drum Roll) The next Discworld novel will be... RAISING STEAM. 8th March 2013: We have to make it clear that there's no date for publication, no deadline and no you can't pre-order yet because we haven't finished it. [UK, New] Wyrd Sisters will be performed at Gordon Craig Theatre, Stevenage, Herts on Fri Mar 29 | 7:30pm by the Wednesday SDA class. Friends, Members and Group bookers (10+) please contact the Box Office on: 01438 363200 for any available discount. All prices include a 1.00 GBP restoration fee. [UK, New] Wyrd Sisters will be performed by Bawds in Cambridge at the ADC Theatre from Tue 16 - Sat 20 April 2013. 9 GBP / 7 GBP concessions on Tuesday, Wednesday and Matinee 10 GBP / 8 GBP concessions on Thursday - Saturday. [UK] Swansea Little Theatre Presents The Fifth Elephant at the Dylan Thomas Theatre Swansea UK from 17th - 20th of April 2013 at 7:30pm. Tickets cost 10 GBP (9 GBP concessions). [UK, New] The Brighton University Drama Society will be performing Mort at Sallis Benney Theatre, 58-67 Grand Parade, Brighton, East Sussex BN2 0JY from 19th - 21th April 2013. Performances start at 7pm (Doors 6:45pm) and tickets cost 7 GBP (5 GBP Concessions) . Tickets cost 6 GBP per head, no concessions, sorry. In addition to supporting the Orangutan Foundation, as all SB plays do, the Players also raise funds for a local charity, this year donations will go to the Great Oaks Hospice. [UK, New] Terry will lead an evening of literature, poetry and spoken word on Tuesday 30th April at the Union Chapel, Islington in support of Dignity in Dying. All proceeds from ticket sales will go towards Dignity in Dying. Please note the direct link to the ordering pages doesn't work so select Events and scroll down to 30 April for details. Tickets cost 23 GBP + booking fee. [UK, New] The Wincanton Spring Fling takes place over the weekend of the 4th and 5th May 2013. The Wincanton events are always special and I look forward to a weekend of games, drinking, chatting, eating, a charity auction, a market place and all the other fun things that tend to get organised on these weekends. [UK] A small drama group are planning on performing Monstrous Regiment from 23rd to 25th May 2013 at The Exchange, Sturminster Newton, Dorset. Apparently The Exchange is a great 300 seat venue. The group are looking for any society events which might like to be arranged at the same time? According to the group Terry lives within spitting distance of the venue and has been to it before and they are hoping he may come along as well. Perhaps even Stephen Briggs! Who knows? Dr. Jack Cohen will sadly no longer be able to attend due to ill health. The Convention organisers say they now have some special items for the charity auction and that they do have a lovely beach and there will be a barbeque on Saturday evening. [UK, Updated] Monstrous Productions Theatre Company will be performing Carpe Jugulum in June 2013 in Cardiff. All proceeds from the performances will be donated to Alzheimer's Research UK. The performances take place from 26th to 29th June 2013 and tickets cost 8 GBP (6GBP concessions). [UK] Nine Worlds Geekfest Convention takes place from the 9th - 11th August 2013. It's about gaming, film, cosplay, fandom, literature, science, geek culture, meeting people and having a really big party. There will be a Discworld stream within the convention. With a 1000 camels the German Discworld Convention moves to the mysterious continent of Klatch! Make room in your schedule from October 3rd to 6th in 2013 for the fourth German Discworld Convention. Be there when it's getting hot! [IE] The Third Irish Discworld Convention 2013 takes place from Friday 1st November to Monday 4th November 2013 at Radisson Blu Hotel in Limerick, Ireland. Other details are sketchy at the moment. Thanks to the people who have already bought some and I wish you many years of happy book collecting ahead. We assume any correspondence is eligible for use in the newsletter unless otherwise stated, including the sender's email address. We may also edit your letters while enjoying pre-birthday issue drinks. I had been out of the office all morning and into the early afternoon. On returning to the good old workplace I decided to check the BBC news and you can imagine my surprise when I saw the headline "Missing Ring found on Carrot". Had the newshounds of the BBC desperate for some new angle, decided to investigate the death of Edward d'Eath? Were they going to try and find the evidence that he had gathered in pursuit of the king? Had Carrot retained the ring for himself? Sadly, No was the answer to the questions that sprang immediately to mind. It turns out that a lost ring had been found with a carrot growing through it and was reported from Sweden by Dagens Nyheter (missing an R there surely) but just another example of intrusion into our universe by Discworld. If nothing else it made me smile which lightened an otherwise anagram of a fish day. I live in Bristol, and want to meet other people who like Terry Pratchett's Books etc. I'm particularly interested in going to Wincanton to visit the Shop etc,but it's really hard to get there by bus or train from Bristol for a day trip, and I don't drive. Also,would be interested in knowing anybody who goes to TP events. You may be getting a lot of emails about this, but I just read the latest issue of Discworld Monthly with the question about reading order. While the DWM site does accurately represent the publication order of the books, it isn't necessarily the best reading order. There are a number of primary themes in Pratchett's books, which the fans have grouped the books by. In the early days, these were "Rincewind", "The Witches", "Death" and "The Watch", and each series-within-a-series could be read on its own. Things have obviously developed now and there are more interconnections and themes. 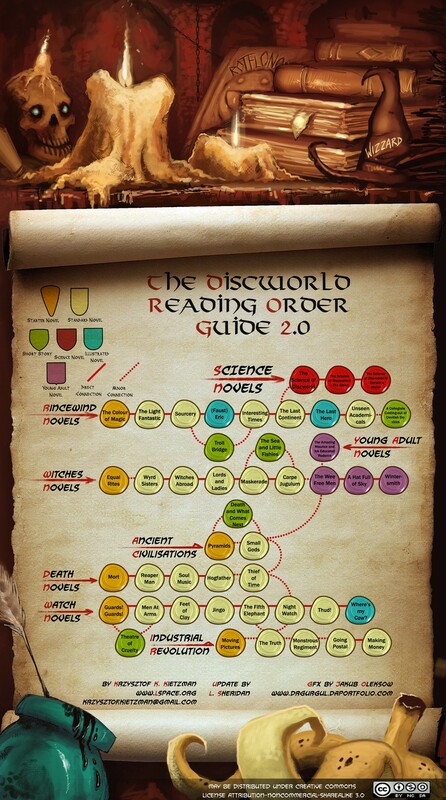 The prettiest (but not quite up-to-date) reading list is on LSpace.org (http://www.lspace.org/books/reading-order-guides/the-discworld-reading-order-guide-20.jpg) and has international translations (http://www.lspace.org/books/reading-order-guides/). 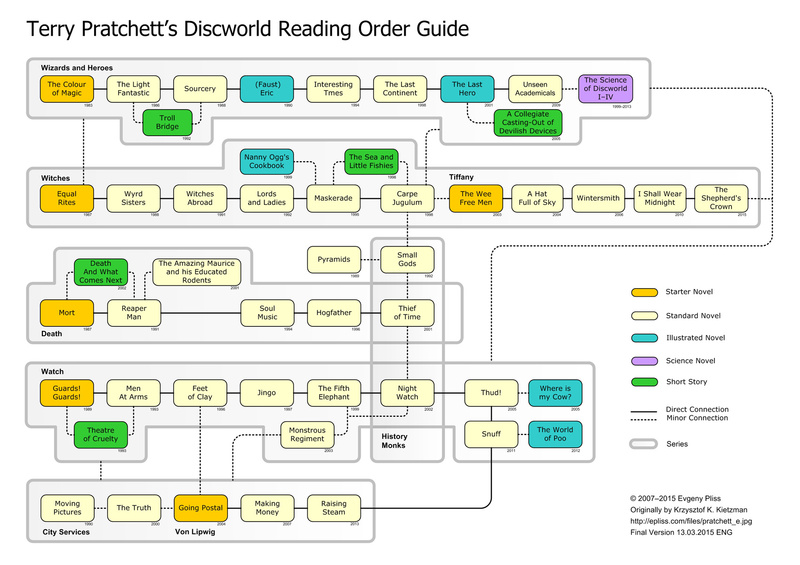 The less pretty but more up-to-date reading order, complete with an extra "history monks" reading order, is at http://epliss.com/files/pratchett_e.jpg and appears to take some inspiration for its differences in ordering from the suggestions in a text-only list (http://www.poslarchive.com/math/misc/discworld.html). One thing to note with both lists is that while Eric is listed as an "illustrated novel", I think the illustrated edition isn't as common as the unillustrated paperback (unlike The Last Hero and Where's My Cow, which I'm only aware of as illustrated versions). I was wondering if you have any full length pictures of Fion the Nac Mac Feegle. We named our dog after her and she's not getting any younger!! I'm wanting to get her tatooed on my leg. I hope you can help me or point me in the direction of where I can be helped!!! Thank you very much for your time.. I don't know if Terry had come across an item on a creature like this when he was writing Nation, and made it into the "Tree Climbing Octopi" - 'A Tree Lobster'! but it's a good match! I am writing as a confirmed Discworld fan since I bought the Colour of Magic 30 years ago. For the last 5 years I have been working for a charity in Afghanistan and one of our favourite pastimes is to do play readings. I was wondering if you could tell me how I can get hold of some of the adaptations of Terry's novels so that I can introduce my friends to the delights of Discworld? Of course you might be the cause of discord between my wife and me as I have a habit of reading in bed and she cannot sleep because of the constant chuckling (not to mention quoting passages that particularly stand out). DWM replies: Not sure how easy it will be to deliver to Afghanistan but Amazon list a lot of the plays. Some of them are available for Kindle so if you have one of their ebook readers you might be able to get them that way. I have just finished reading a totally engrossing book simply called London by Peter Ackroyd (published in Great Britain 2000 by Chatto & Wyndus). As the title suggests the whole book is about the history of London. Quite honestly, if Discworld wasn't born some 20 years earlier you could reasonably assume that this was the font from which one T Pratchett sourced all of his plots, characters and backdrop. It is common knowledge that Ankh Morpork is based on London but I was staggered to read that one Wynkyn de Worde had, in 1500, the first printing press (cf William de Worde (The Truth)). There is an interesting article on toshers (Dodger) the Tyburn prison bears a striking likeness to the Tanty, a very insalubrious part of London in the 16thy century was known as the Shadows (NB The Shades) there are all the guilds including the Thieves Guild and many a prostitute who was called up in front of the magistrates gave her occupation as "seamstress". There were so many other references echoing Ankh Morpork that I found myself laughing out loud at times. Did you know that Dodger came from an area in London called Seven Dials which in the 18th century had the main entrance to the sewers of the East End. A truly fascinating book. DWM replies: Quite agree that London (the city and its history, if not the book) is a great source of inspiration for A-M, Sean. There must also be numerous other fictional and non-fictional cities that have fed into A-M - Fritz Leiber's Lankhmar always struck me as a prominent influence in the early days of Rincewind & Twoflower. But that's not why I'm telling you lot... What got me was there was this scene where the Clowns take Stitches' ashes, and give the guy a funeral. And as they were doing that, they take his Face Egg, and put it in a room with hundreds of other Eggs... And I was forcibly reminded of Mr Pratchetts Hall of Faces within the Guild of Fools. Lobsters perform an important role at Unseen University. Other than food, what are described as Lobsters? Who was Herbert 'Leggy' Gaskin? What theory did You Vicious Brute write? The Discworld story in the fourth instalment of The Science of Discworld ostensibly deals with the ownership of Roundworld. The latter day Omnians have decided that the Discworld is actually round and therefore try to claim ownership to Roundworld on religious grounds. The science bit (and much longer part) deals with many subjects including among others the shape of the universe, religion, monotheism vs polytheism, the definition of facts, the Large Hadron Collider and the differences between human-centric views of the universe and universe-centric views. The Discworld Story is quite fun and it's good to seem some old characters such as Rincewind get a mention. Rincewind is the current custodian of Roundworld which he keeps on a shelf in his study. There is also some reference back to the adventures in The Last Hero where the band of adventurers get to see Great A'Tuin and the elephants close up. Personally I'd like to take the Discworld story out and read it as a story and keep the science separate. I think given enough time - something in short supply here - I'd like to re-read and properly digest what Jack and Ian are trying to say. All too often I found myself reading the words but not understanding the sentences. I am sure I must have taken in more than I can recall at the moment.. If you have a scientific bent then this is a great book to read for the current thinking on lots of scientific theories. If not, there is a fun short Discworld story with a great Roundworld character called Marjorie who is a librarian who's once or twice seen an orangutan swinging through her library in London. The University Porters, who double, with rather more enthusiasm, as its private police, or proctors. It is said to be ruled by a queen who lives forever. Iron Lilly is the nickname of the woman who teaches games at the Quirm College for Daughters of Gentlefolk. The Theory of Transient Integrals.